Manila—(PHStocks)—After the recovery last Friday, Philippine stocks again faced another bout of profit taking, fuelled by continued media speculation on whether or not the US Fed will end or reduce its stimulus programme early. 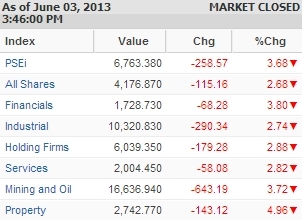 The Philippine Stock Exchange (PSE) index shed 3.68% or 258.57 points to close the market at 6,763.38 today, June 4. Value turnover, in particular, reached PhP16.58 billion amid traded volume of 2 billion shares. All counters were bleeding. The biggest loser was the Property segment, which shed 143.12 points or nearly 5%. The Financials dropped by 3.8%, while the Mining and Oil segment slid by 3.72%. The wider All Shares index declined by 2.68%. There were 33 gainers today against 138 decliners, while 33 stocks were flat. The top most active stocks were GT Capital Holdings Inc. (PSE: GTCAP), SM Investments Corporation (SMIC, PSE: SM), Metropolitan Bank & Trust Company (Metrobank, PSE: MBT), SM Prime Holdings Inc. (PSE: SMPH), Puregold Price Club Inc. (PSE: PGOLD).